There's a new No. 1 on the semi annual-list of the world's top supercomputers: Japan's K Computer is so far advanced, it's three times faster than the second fastest supercomputer and more powerful than the next five supercomputers on the list combined. The so-called Top 500 list is revised each June and November by researchers at the National Energy Research Scientific Computing Center, the University of Tennessee in Knoxville and the University of Mannheim in Germany. Supercomputers and their massive processing power are used for an array of tasks such as weather forecasting, high-speed stock trading, and simulating weapons tests. 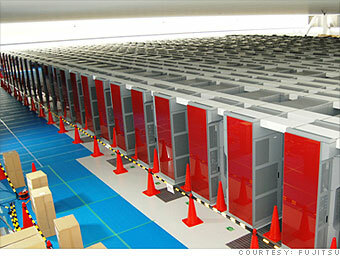 The K Computer, built by Fujitsu, has 68,544 central processing units, each with eight cores. That's twice as many as any other supercomputer on the Top 500. The letter "K" is short for the Japanese word "kei," which symbolizes ten quadrillions. The K Computer is capable of performing more than 8 quadrillion calculations per second. The project won't be completely finished until next year, at which point the Riken Institute plans to share its computing power for researchers' projects around the world.